My students aren’t quite ready to write their own resumes but there is still a place for this app in my classroom. A great way to replace or extend a biography project is to create a resume of the person you are studying. 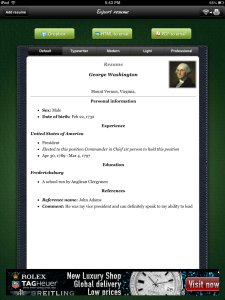 Have students use the Pocket Mobile Resume app to demonstrate their knowledge of a historical figure’s personal information, experience and education, while choosing contemporaries to act as references and identify the skills and strengths of this person. Try it out in your classroom! Check out my Common Core aligned lesson plan using this app in the classroom! Here’s another Common Core aligned lesson plan using this app in the classroom!